Don't let past abuse keep you from enjoying a happier positive future - this subliminal mp3 will help give you a brand new head start in your life! Do you find it difficult to let go of your painful past of abuse? Do you feel you're not capable of succeeding in life because you've been abused? Do you want to stop living in the past and live your life from a more positive perspective? Abuse of any kind can be devastating. Unfortunately, if you are a survivor of physical, sexual or even emotional abuse it can be really difficult to move on with your life. You can get stuck in a pattern of constantly replaying your past life of abuse over and over again in your mind like a bad habit. This will limit your whole life so much and keep you locked in an emotionally charged, negative mindset which will hold you back. 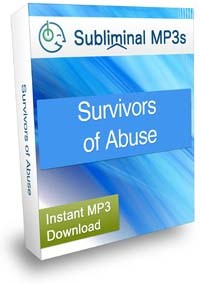 This subliminal mp3 can has been designed to give you the helping hand you need to break free of your past of abuse, put the past behind you, and change your mindset to focus on a brighter future and simply live your life. The messages on this album will go to work deep within your subconscious mind. This is why subliminal messaging can be an effective way to change - it can reach your subconscious, where your deepest thoughts and memories and feelings towards your past are held. In time you will stop focusing on past hurts and instead look forward to the positive future ahead of you. You can experience life from a brand new perspective! You are no longer held captive by the abuse you experienced in your past. You are free from your past and looking forward to the future. This opens up a new and exciting life for you, socially you are more outgoing and positive. You feel in control of your life and this gives you a new level of self confidence you haven't felt in years! You finally realize that you are a survivor and you can accomplish anything you put your mind to! You know without a doubt that your ability to succeed is not determined by your past and you fully embrace this new attitude. Suddenly you feel stronger and happier about your future. See yourself, probably for the first time, starting a brand new chapter in your life. Feeling totally ready to move on with your life and this instantly gives you a feeling of security and peace of mind. You will be excited about the future, and looking forwards rather than living in the shadow of your past. Give the subliminal messages on this album time to make the necessary changes in your mindset. That means listening everyday and then letting yourself change. You'll know when the subliminals are working when you begin to notice you're no longer focusing so much on the abuse you suffered in the past. Instead you'll begin to feel more confident and excited about creating positive changes for your future. When you feel these urges just go with it and see where this new way of thinking takes you. Download this subliminal today and before you know it the positive future you want will begin to take shape. We have two albums which can work well alongside this album. Let go of resentment will help you to stop holding on to negative emotions, and if you are really ready to move on then our forgiving others album can be used as a final step.